In these divided times, religious institutions are losing young members and even closing their doors at an alarming rate. Aaron Wolf’s personal journey of rediscovery comes alive in Restoring Tomorrow, a universal story of hope as a treasured local temple near demise, is lifted up by a community’s determination to achieve the impossible. Aaron's journey explores how when any community puts their mind to it, the impossible becomes possible. Wilshire Boulevard Temple, a Los Angeles treasure built by the original Hollywood moguls, needs to raise millions to restore its majesty and vibrancy, thus also restoring the future of the Jewish community, the greater Los Angeles community—and on a personal level, Aaron himself. “In a world so divided, we need to come together. Restoring Tomorrow is a story of hope, community and unity. In a city full of Hollywood icons, the largest is one that I took for granted and nearly lost, the Wilshire Boulevard Temple. Like many younger adults, I lost my connection with the place I grew up and with my religion and heritage. My place. My family’s place. In traveling around while making the film, I felt I was becoming something of a microcosm for my generation, as I came to reconnect with my roots and heritage. My hope is that Restoring Tomorrow connects others to their roots, wherever they may be, and leads others on their own movement to restore something meaningful to them. It is something, I’ve come to realize, is more important than ever. Aaron’s narrative films include the award-winning Guest House, starring Michael Gross (Family Ties, Tremors, Suits) and Heather Lind (Boardwalk Empire, Turn); and The Walk, starring Wolf and Oscar- and Emmy-nominee Peter Riegert (Animal House, Crossing Delancey, The Mask). Currently, Aaron is wrapping up post-production on the feature film, TAR, a thriller about an ancient creature beneath the La Brea Tar Pits that is awoken by the construction of the new Los Angeles subway, attacking the city and a family. Aaron stars as the son, along with Oscar-nominees Timothy Bottoms (Last Picture Show, The Paper Chase) and Graham Greene (Dances With Wolves, The Green Mile, Die Hard) and Max Perlich (Cliffhanger, Maverick). Find tickets to Restoring Tomorrow. RESTORING TOMORROW In these divided times, religious institutions are losing young members and even closing their doors at an alarming rate. 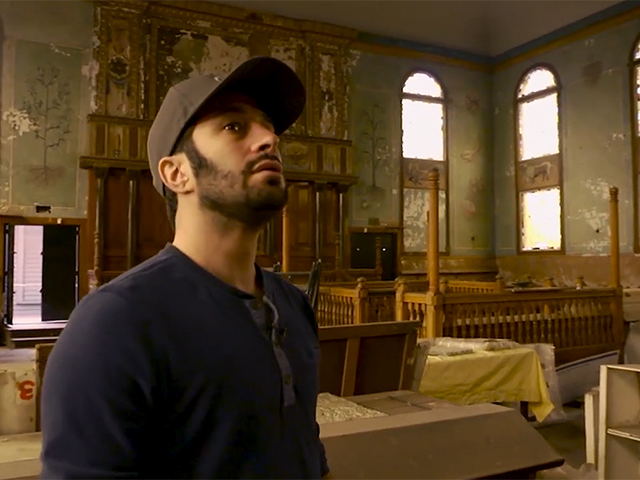 Aaron Wolf’s personal journey of rediscovery comes alive in Restoring Tomorrow, a universal story of hope as a treasured local temple near demise, is lifted up by a community’s determination to achieve the impossible.